Tigers ended the first day of first Test with disappointment as the hosts are in the driving seat at the end of the day. 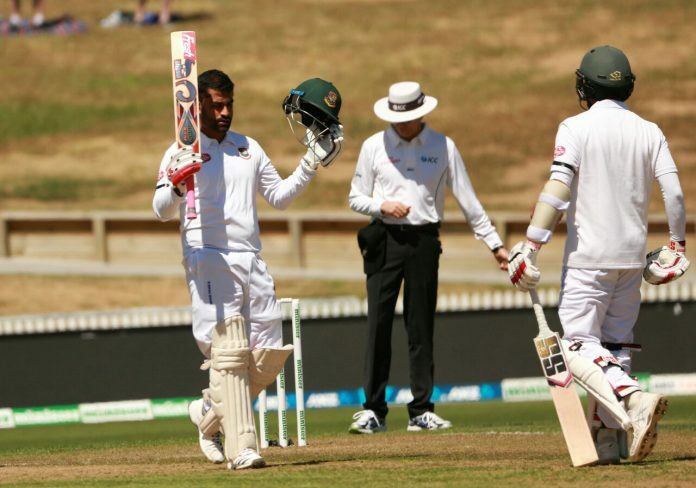 New Zealand posted 87 without loss in response to Bangladesh’s 234 in the first innings. They trail by 148 runs. Earlier Mahmudullah opted to bat first after winning the toss at the Seddon Park. Ebadat Hossain made his debut. Tamim Iqbal and Shadman Islam gave Bangladesh a flying start as they added 57 runs in 10.2 overs before Trent Boult removed Shadman on 24. But Tamim kept going strong as he went onto made a 64-run stand with Mominul Haque who contributed 12 in the partnership. Neil Wagner broke the partnership by dismissing Mominul and then claimed the wicket of Mohammad Mithun couple of overs later. Soumya Sarkar too got out cheaply by Tim Southee. Tamim on the other end picked up his 9th Test century. Colin de Grandhomme got rid of Tamim on 124 off 128 balls as the Tigers were reduced to 180 for 5. Skipper Mahmudullah and Liton Das got the start but failed to score bis Bangladesh were all out for 234 in the first innings. Wagner grabbed 5 wickets for 47. In reply, to opener Jeet Raval and Tom Latham frustrated the Bangladesh bowlers as they made an unbeaten 86-run stand in 28 overs. Raval was not out on 51 and Latham was on 35.